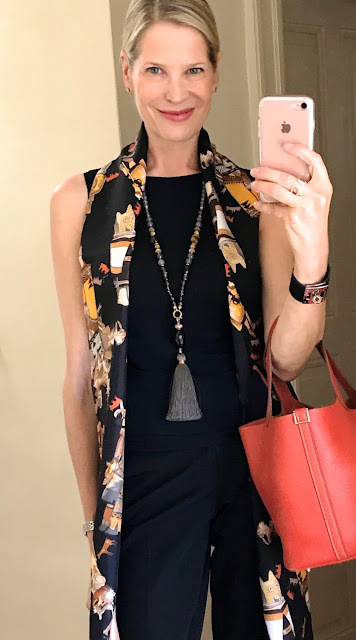 With perfect timing, some new MaiTai Collection items arrived at the right moment to join in to the final part of the Hermes window autumn inspiration series. Hope you like the resulting looks and the mixes of new and existing pieces! 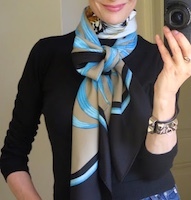 Parures des Samourais 90 scarf tied into a cowboy knot (instead of bringing the ends forward, they are tied with a Petite Classique scarf ring in the basic slide behind the neck (you can make a small double knot instead). 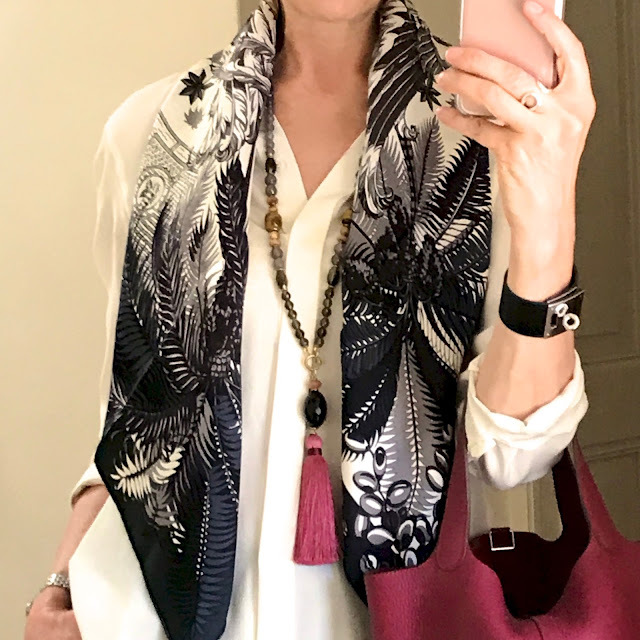 Accessoires: MaiTai Collection new long gemstone necklace in Bleu Jean/Labradorite/Garnet (available here), Hermes clic-clac H braclet in Bleu Indiens and Evelyne 29 in Bleu Agate. 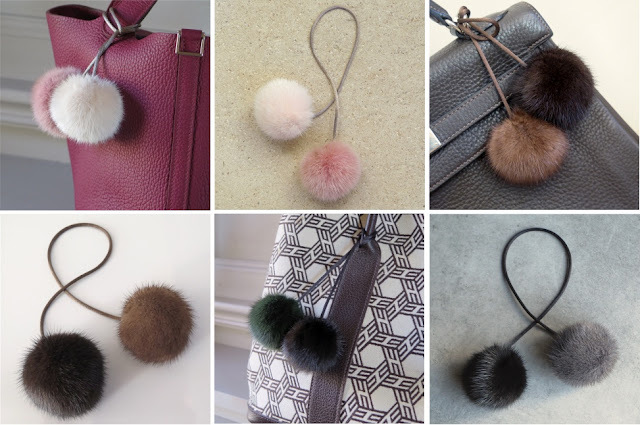 Also new: MaiTai Collection mink bag charms, available as single poms (here) and double poms (here) Made in France. The new gemstone necklace colors are gorgeous, dear MT! 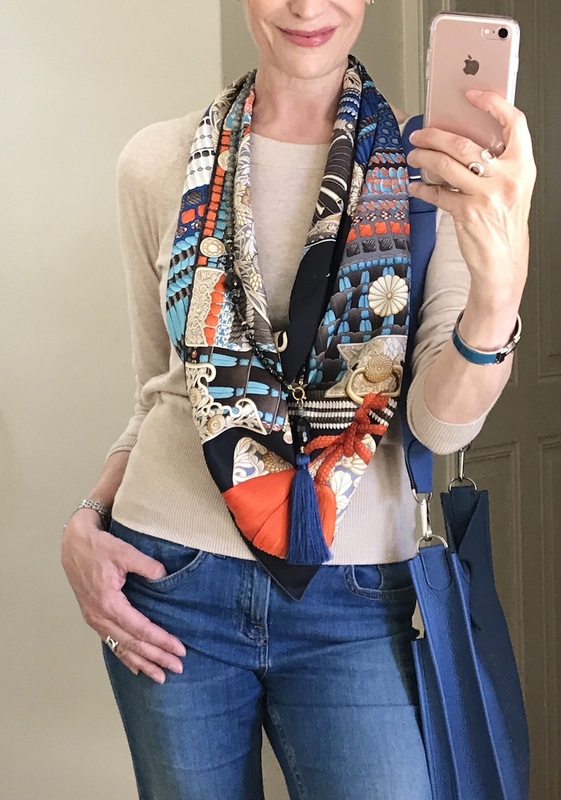 And turquoise, which I always thought of as a summer color, is quite versatile for autumn, too (and winter as well, I daresay). In fact, the Tigre Royale combinations were my favorites! Happy Halloweeeeen to yoooooou and all the Swans! OH, the colors ON YOU are ABSOLUTELY FABULOUS!THAT MUSTARD SKIRT! BLUE Is your BEST FRIEND! Such a delight to see YOU in my INBOX! HERMES, should HIRE YOU to be their MODEL!!!!!!!! Adore the precious fur poms, too. Nothing like pampering your favorite bags with a touch of mink. As usual, you've outdone yourself. Dear Jerrine, congratulations on that thrilling Astros 13-12 win! Go, Houston! Well, I was just a bystander. It's Trudye that you need to congratulate. I basically don't know one team from the next, but I was cheering for Houston just because Houston deserves it after what they endured a few months ago. Yes, go Astros; go Houston! I hope you're well settled into your new nest. Congratulations. one again all I can say is WOW! 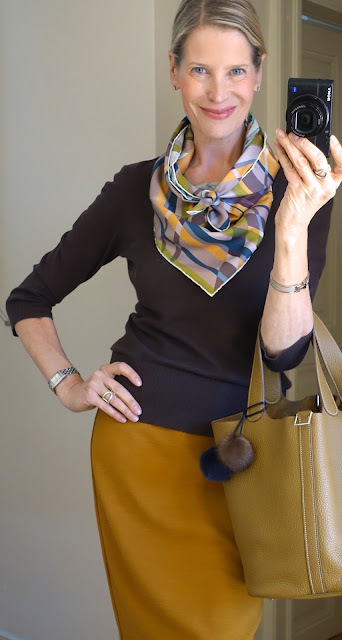 I love these color combinations and how you mix scarves, chains and bags. Excellent. 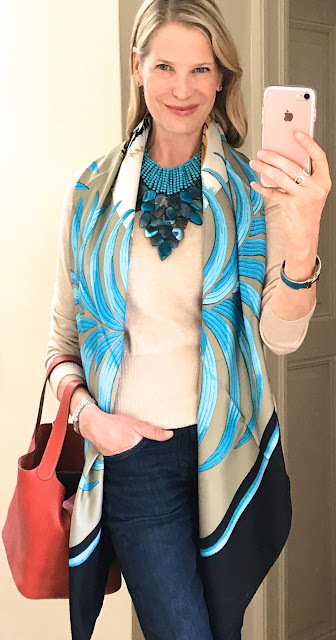 A real stunner is your turquoise necklace with the Tigre Royal shawl. A very HAPPY week to you and yours! Your post is a killer...temptation all around! I agree with Jerrine and Fifi- the Tigre royal with the turquoise is a stunning! But my heart beats for blue jean - I tried to resist these gemstone tassel necklaces for the longest time, I already have similar ones in stock - but now I give in! The way you combined them with the same scarves I have is just too convincing...and I spied with my little eyes that you have added the jardin à Sintra in the very CW that I have been considering...sigh. Running over to your shop to place my order. You are a genius!! Ha, Katja, resisting is futile, and I'm glad to read that you've given in to your urges! You will love it. What color did you order? Yes, I admit; I'm nosey. 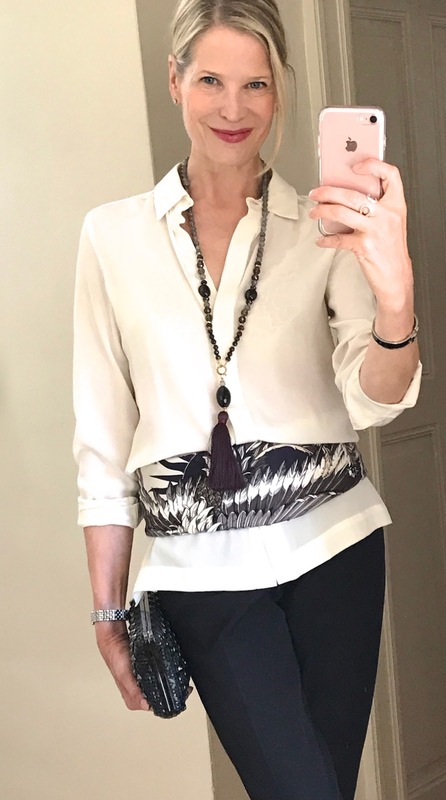 I'm sure I will, dear Jerrine- not a single item of MaiTai's collection that I don't hold dear or don't use much...ha, I've given you a hint...but I don't want to keep the suspense...it's the blue jean one that stole my heart! And I can't wait to receive it- but I fear it also calls for another round at my favourite orange shop...neverending! Hope you survived Halloween- we're having a quiet day today. Beautiful choice, and it should be perfect for you, and H. will pay MT a commission after your next shop visit. Sure they will . . . in some alternate universe! You'd better hurry, dear Katja! I waited too long and the Smokey Quartz is sold out! This time I did, dear Fifi, it's already on its way! It happened to me all too often...I'm sure dear MaiTai will organize new stock, fingers crossed! Wow and wow, darling MT, another spectacular launch for the MT Collection! 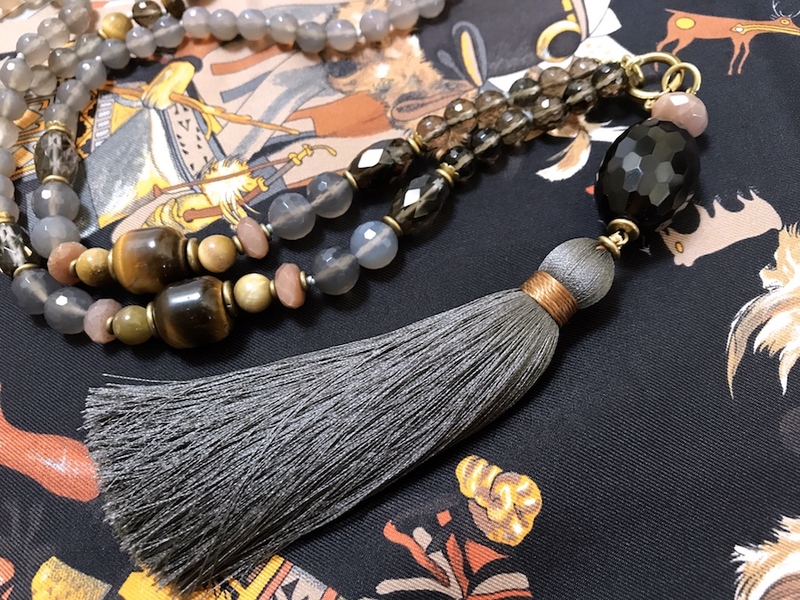 In love with the new colors of the gemstone tassel necklaces and the mink pom poms are beyond adorable! I am sure this latest launch will be sold out in no time! Congrats darling! P.S. Have to add: So proud of our Astros in the World Series! Such a needed lift for our city! I will say it again. FLY ASTROS, FLY! And, they were a "do" for sure - World Series Winners. Don't worry about it, Fifi. I "misplace" mine about three times a week. Happy Fall, y'all! What a great way to celebrate--new MT merchandise and an Astros win! It's almost taken my mind off the rising temps here in the south--it just doesn't feel like November!! But I'm thankful for all my Swan friends, for MT for providing such beautiful inspiration and for November because it holds Thanksgiving--my favorite holiday! I hope everyone enjoys the beautiful photos and gets their order fulfilled--so much to be thankful for! Grumble . . . grumble. It was 32 here last Saturday morning, and tomorrow it's supposed to be 82. Greta, I've had it! I want it to get cold again and stay cold for about three years. J'ai adoré cette dernière vitrine ainsi que les propositions assorties. 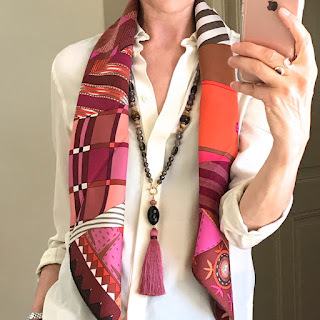 De même les nouveaux colliers sont magnifiques. Le bleu jeans me fait très envie !!! Aujourd'hui, en Suisse, c'est vraiment l'automne avec pluie, grisaille et chute des températures. Je me réjouis de sortir mes cols de fourrure commandés pendant l'été. Un grand merci pour ces jolies images, très beau dimanche au sud de la France et ailleurs ! PS : MaiTai, quelle est ta taille ? Je souhaiterais m'offrir un Evelyne Bag et j'aimerais un point de repère. D'avance merci.